Bhairo Restaurant, Taj Lake Palace. +91 294 242 8800. 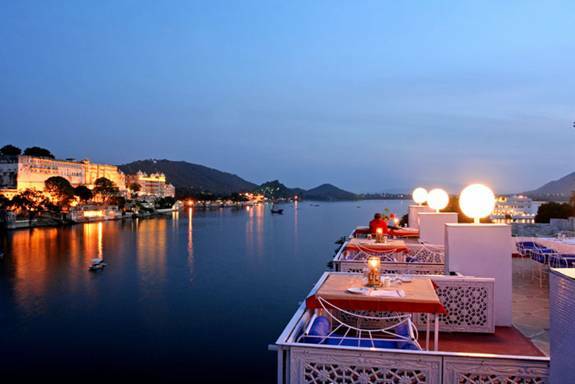 Nestled in the rooftop, this open air restaurant offers a scintillating view of the beautifully lit Palace of the King of Mewar and the sparkling waters of Lake Pichola. 7pm—10pm (Depending on the weather condition of the day). Ambrai Restaurant, Amet Haveli, Hanuman Ghat, Udaipur, India. +91 294 243 1085. Great lake, great restaurant. Sit watching the sun set on the lake palace. A stunning night time view of the hotel in the centre of the lake and the Jag Mandir. Reach on foot. Just cross the little pedestrian bridge and turn the next street left. That street you follow to the end and there is the restaurant on the left hand side. Mayur Roof Top Restaurant, Hotel Baba Palace, 155 Jagdish Chowk (opp. Jagdish Temple) Old City, Udaipur 313001. +91 294 242 7126. Rooftop Cafe opposite Jagdish Temple. Mayur Rooftop Restaurant is the highest roof top in the centre of the city from where you can see the amazing view of the City surrounded by aravali range and the City Palace and Jagdish temple. Go up further to get the view from the watch tower. 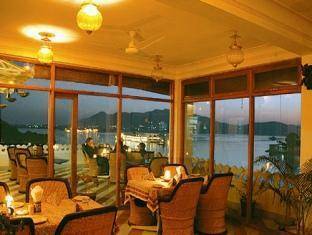 The view of the fully lit Udaipur palace is just amazing. Jarokha Restaurant, Jagat Niwas Palace, 24-5 Lai Ghat, Udaipur. +91 294 242 0133. Fabulous lake views. Sunset Terrace Restaurant, Fateh Prakash Palace, Bansi Ghat, Lake Picola. +91 294 252 8016. Superb lake palace views. Sunset cafe. Luncheon and light refreshments throughout the day. 7am-10.30pm. Gallery Restaurant, Fateh Prakash, Superb views. Gokul, Minerva Hotel, Rooftop, good views, great divans. Bagore-ki-Haveli, Gangar Ghat, +91 294 309 0686. Fantastic lakeside setting. The Jheel Guest House Rooftop Restaurant. Fine dining at Jheel. A beautiful setting overhanging the lake. 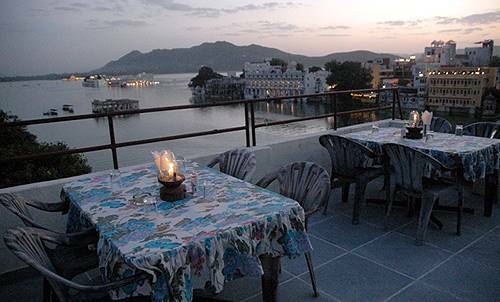 Sunrise Rooftop Restaurant, 18 Gangaur Ghat Rd, Udaipur. Dream Heaven Guest House, Hanuman Ghat, O/s Chandpole, Udaipur 313001. +91 294 243 1038. Roof-top restaurant. Wonder View Palace, 6 Panchdevri Marg, Hanuman Ghat, Udaipur 313001. Outside Chandpole. 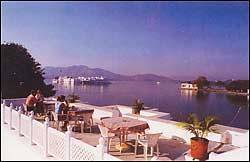 Hotel Hanuman Ghat, Hanuman Ghat, Udaipur 313001. +91 9680 749711 Outside Chandpole. Great lake view. 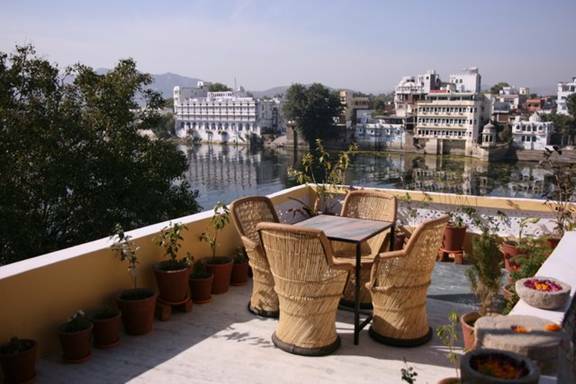 Panorama Guest House, Hanuman Ghat, O/s Chandpole, Udaipur, 313001. +91 294 243 1027. Hilltop Hotel Palace, 5 Ambavgarh, Udaipur 313001, India. Rooftop terrace bar. Overlooking lake Fatehsagar, Swaroopsagar and the town. Hotel Udai NIwas, 5th floor, Udaipur 313001, India. rooftop restaurant. Anna's, crn Lai Ghat and Gangaur Ghat. Udaipur 313001, India. Rooftop. Rass Leela, Sony Ji Ki Bari, Adjoining The Leela, Outside Chandpole Udaipur (Raj) 313001. +91 90 0199 2599 Right on the lake.